Today I found out about the Great Emu War of 1932. Emus are native to Australia, and as everyone knows, nearly everything in Australia seems capable of killing you. If the sun doesn’t do it, there are still redback spiders, funnel webs, and Taipans, and others to contend with. It should come as no surprise, then, that the emu—part ostrich, part velociraptor—is also an annoyance bent on making the lives of people living in Australia miserable. Okay, so I was only joking about the velociraptor part, but in truth, velociraptors are thought to have had feathers, and looked something like a modern day turkey, contrary to what Jurassic Park would have you believe. Emus more strongly resemble ostriches. They are large, tall flightless birds with long necks and fluffy feathers. They live and breed in the middle portion of Australia which is largely uninhabitable by anyone with sense. However, they don’t mind traveling far and wide in search of food and water. In the wake of World War I, over 5000 veterans had set up camp on the fringes of the emus’ habitats in Western Australia. It was part of a soldier settlement program to help the soldiers make a living farming the land. However, drought caused many of the crops to fail, and emus had a tendency to gobble up what was left. Unfortunately, prices of things had skyrocketed after the war, meaning many of these ex-soldiers couldn’t afford fences to keep the birds out. Being soldiers, they grabbed their guns and started shooting the birds. Some 3000 emus were killed in 1928. However, despite these killings, by 1932, an estimated 20,000 emus invaded the farmers’ fields and the bountiful food supply they provided. The farmers knew they had to do something. The usual way to lodge a complaint about farming conditions would have been to appeal to the Minister of Agriculture. The ex-soldier farmers didn’t trust the Minister of Agriculture, though, so they approached the Minister of Defence instead, who more or less declared war on the birds. He granted the farmers the use of two Lewis machine guns and 10,000 bullets, plus the expertise of two gunners and Major G.P.W. Meredith. Given these resources, this was sure to be an easy victory. Meredith led the assault on the emus, only to find that the enemy was quick and cunning. Emus enjoyed the shade of nearby trees when they weren’t chomping on the wheat crops, and with the vegetative cover, the gunners couldn’t get a clean shot. In addition, after a few battles, the emus seemed to work out the range of the guns—they always stayed just out of that range. One of the first battles ended in a spectacular failure on the part of the Australian farmer-soldiers. About 100 emus had gathered in one place, and the soldiers decided to ambush them with one machine gun, thinking that they could take care of most of them pretty quickly. After about a dozen bullets fired, the machine gun jammed, giving the birds ample opportunity to run off, escaping to fight another day. When Meredith and his Merry Men realized how fast the emus could run, they had the idea to attach a machine gun on the back of a moving vehicle and chase after them. Again, this tactic failed. The gunman was too busy attempting to hold on to shoot the gun. The emus raced to the relative safety of the trees, regrouped, and scattered. Even if the gunner had been able to shoot, the vehicle would only be able to chase after one bird at a time, making it impossible to kill off a large number of birds at once. Not a single bird was killed using this tactic. If we had a military division with the bullet-carrying capacity of these birds, it would face any army in the world. They could face machine guns with the invulnerability of tanks. They are like Zulus, whom even dum dum bullets would not stop. The emus did wander off eventually, but that was because the wheat was harvested and they had little left to eat—not because they couldn’t stand up to the might of man and his machine gun. Australia has two national animals: the kangaroo and the emu. It is acceptable to eat both of these creatures, something that might very well be unique to Australia. Can you imagine if the US government gave the OK to roast a bald eagle or two? Emus are now farmed for their oil, as well as meat, feathers, and leather. The aborigines used emu oil for its healing powers, including relieving aches and pains, swelling, and inflammation. It can also be used as a moisturizer and has anti-bacterial, anti-microbial, and anti-inflammatory properties. It is currently used in many sunscreens, hair products, and pet care products. 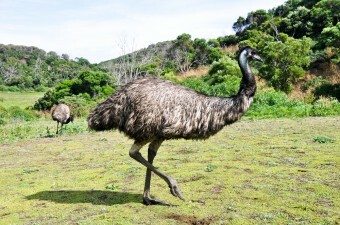 Mature emus range in size from 5 to 6 feet in height and usually weigh between 90 and 120 pounds. They can run at speeds up to 40 miles per hour, covering about nine feet with every stride. You’ve heard of robin’s egg blue, but how about emu’s egg green? Emu eggs are a dark emerald green in colour. Emu eggs can be eaten, and have a mild flavour. They are about the size of ten chicken eggs. ….another noted that medals should be given to the emus….HA HA HA…A HILARIOUS AND MOVING ACCOUNT OF THE CRUSADE, BUT I FAILED TO UNDERSTAND ONE PART, THAT BEING THAT HOW WERE THEY ABLE TO SURVIVE THE BULLETS LODGED INTO THEIR BODS….EVASION IS UNDERSTANDABLE, BUT HIT, THATS ANOTHER MATTER. ALSO, IN INDIA I HAVE READ REPEATEDLY IN VARIOUS NEWSPAPERS AFTER THE GREAT “EMU SCAM” (AN INTERESTING TOPIC FOR YOUR NEXT COVERAGE) THAT EMU & BYPRODUCTS HAS NO COMMERCIAL VALUE, OR RATHER TOO MUCH OVERHYPED VALUE. RGDS. LOVEPAREEK. How do you get oil out an emu? Very carefully Partick. Very carefully. Oh my god. This is actually hilarious. The emus sure deserve a badge of honour! I can’t stop laughing. To think this actually happened. Oh my god. All hail the Almighty Emu. * They attack (I have the scars to prove it). * Egg dishes at Disney World are made from emu eggs; “turkey legs” sold in the park aren’t called turkey legs because they’re ostrich legs. * The Roadrunner and Coyote cartoon has its roots in the Emu War of ’32. The guy who inspired the cartoon (didn’t get credit for it), was part of the “war” and suggested a cartoon about it. No one at that time in America knew what an emu was, and even hapless men trying to kill a roadrunner would rub kids the wrong way, but roadrunners were all over the place in California so they adapted the concept to American audiences and changed the men to a single coyote. That’s why the Roadrunner looks more like an Emu than a roadrunner. Still the best cartoon ever.